1. The wood carvings with orange fabric background on the wall are from Thailand. I wish they were completely in the photo because I'm not sure if we have any other photos with them in it. My Mom's brother gave them to her and seeing them on the wall brings back wonderful memories. 2. A couch covered in hot, sticky plastic. 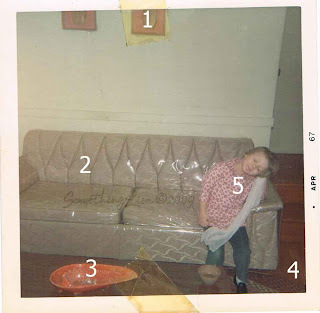 Ah, the good ol' days - if I ever talk about covering my couches in plastic, please slap me. 3. An Orange Ash Tray. I love the color. It matches the orange on the wood carvings. No wonder I love bright colors. However, I don't love that it was actually used to put out cigarettes, my poor little lungs. 4. Look at how beautiful those wood floors are. 5. I was 4 years old here. Wasn't I cute? This pose reminds me of one of my daughters. I have a photo floating around somewhere of her in the same pose. I had the same couch. I will have to find a photo of that! !